A solar array that would have more than doubled Virginia’s solar power will not be built after all, with the developer blaming Dominion Virginia Power and other utilities for their lack of interest in buying the output. This shouldn’t surprise anyone. Virginia has done little to encourage our utilities to buy solar power, and so for the most part they haven’t. The state’s voluntary renewable energy goal is a sorry dishrag of a law. It can be—and is—met with old, out-of-state hydro plants, trash burning, and wood. And because our utilities have a state-sanctioned monopoly on power sales, customers who want solar power can’t go buy it from someone else. But if it isn’t surprising for Virginia to lose a big solar opportunity due to utility intransigence, it is stupid. Virginia consumers would love to buy solar energy, local governments would love to have solar farms generating tax revenue, and local businesses would love to create solar jobs. A win-win-win opportunity is being wasted, at a time when lawmakers complain about how hard it is to reduce our carbon emissions. Last year the General Assembly overwhelmingly passed a bill to support solar development, and then failed to fund it. 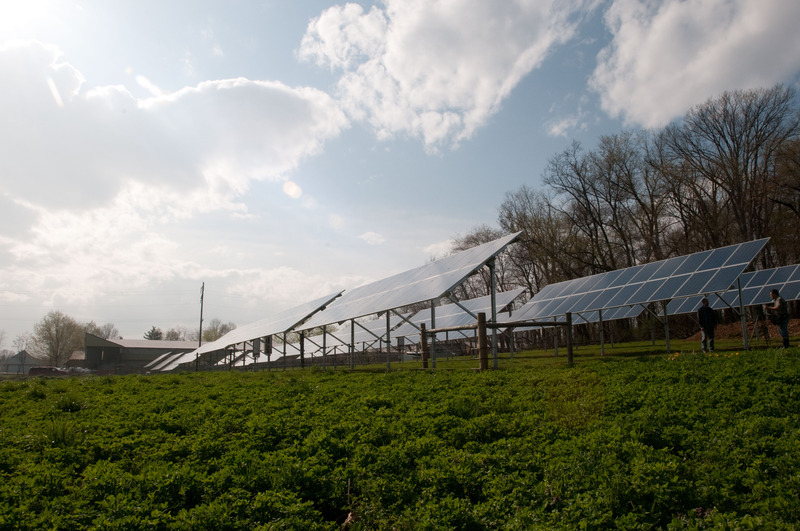 Governor McAuliffe’s energy plan talks a good game on solar, but it’s toothless. We will continue to miss out on opportunities like this one until we have a law that requires Virginia utilities to buy solar, or lets consumers contract for it directly from any willing seller. This entry was posted in Renewable energy, Solar and tagged Dominion Virginia Power, OCI Solar Power, RPS, solar, Terry McAuliffe, Virginia General Assembly. Bookmark the permalink. Yes, and tell us how! Is there any value to writing Kaine, Warner, McAuliffe? There is so much citizen support to this but it falls on deaf ears. I wonder if there is any county government angle, like counties that want a solar incentive but hit the Dominion brick wall too. Would it be reasonable to let Dominion apply a pass-through charge? Much as i dislike Dominion and its obvious, blatant strategy to strangle solar whenever possible, i wonder about using 145 acres of agricultural land for a solar farm. Why not use existing rooftops? A much better resource for solar, and a way to end community reliance on centralized, corporate-owned electricity generation that is vulnerable to disasters both natural and man-made. The use of brownfields for solar, as is being done in NJ and a few other places, makes more sense than agricultural lands, but nothing beats rooftop solar for community security. Chris, we will need both. With 75% of residents unable to have their own rooftop solar, and with most buildings needing more energy than rooftop systems can provide, there is a need for utility-scale projects. Solar farms can also provide power much more cheaply due to the economies of scale. We know how disingenuous Dominion has been in the past. Is there any reason to believe in a Dominion crossover to the truth? Very bluntly, the bottom line is these people are liars and they will do and say ANYTHING that improves the company’s short-term profits. Happy shareholders make happy corporate executives. Good question. When Dominion builds its own facility it can charge ratepayers for the capital cost, and it is allowed to make a profit. If it buys power from someone else it can only pass through the cost, so it doesn’t make a profit. So the answer may be just that simple. I hope to learn more soon. Thanks, this is very helpful. Any predictions about legislative changes to support greater solar adoption. Your blog indicates a great number of bills being introduced by lawmakers but can any of them reach daylight? No pun intended.